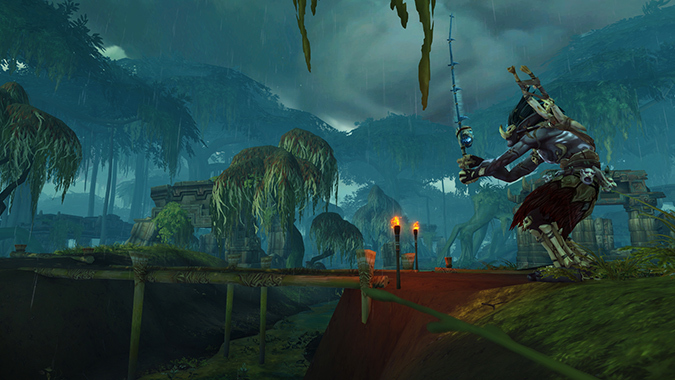 Although I don’t exactly begrudge a loa some good old fashioned recreational sport, I do have to wonder what exactly ol’ Bwonsamdi expects to catch in that little creek, and more importantly, what he’s going to do with it. While these will remain mysteries, I can’t imagine a more suitable fishing pole for the loa of death, can you? I have been out of the Queue loop for a while. So, I have a nOOb question. Question for the Queue: What is the next patch number? Another question: When is it due? Just one more question: What features are (rumored – or real) coming with the patch? Welcome back! The next patch is 8.1.5, due out…well, at some point in the near future, as you can currently playtest all the lovely new stuff on the PTR right now. In 8.1.5, we’ll be able to unlock the Kul Tiras and Zandalar Allied Races, the Darkmoon Faire is getting a new roller coaster, there are some updates to holidays (Children’s Week will have new orphans to cart around! ), the Brawler’s Guild is making its return, Arathi Basin and Warsong Gulch are getting facelifts, and we’ll have shiny new portal rooms in both Stormwind and Orgrimmar. On top of that, there’s some storyline continuation for what happens after the Battle of Dazar’alor, including the return of everyone’s favorite knife. …well, Mitch’s favorite knife anyway. It’s a .5 patch, which means there isn’t a ton of “major” content, but honestly it’s packed with a ton of stuff. If you don’t mind spoilers, you can poke around the PTR for a sneak peek at all the new goodies! Q4tQ: Since Helya isn’t dead, does that mean the deal she made with Sylvanas still exists? Technically yes, but we don’t know the terms of the deal. If she was simply giving Sylvanas the Soulcage, then her half of the bargain was fulfilled, and Sylvanas just lost her shiny new toy shortly after obtaining it. If Helya promised Sylvanas dominion over Eyir and the val’kyr, then her half of the bargain wasn’t fulfilled — Greymane made sure of that. And there’s still the matter of what Sylvanas promised in return…which we still haven’t heard anything about. Long story short, it’s a plot hook that is still very much in play, one way or another. Q4tW: when Saurfang Jr died do you think he went to the Light or the darkness? Neither, or at least not immediately — technically his soul was roomba’d up into Frostmourne, where it sat until he was made into a Death Knight. After he died at our hands in Icecrown Citadel, presumably his soul went right back into the blade. Once Frostmourne was shattered…well, either his spirit lived on in one of the shards, or he went to the dark place that undead appear to go to when they die. My keybinds for my Druids forms all use Shift in them. I find that appropriate. Speaking of, did they ever separate flight from travel? I know when they combined all travel forms into one, it ticked off a lot of people who didn’t want the zone they were in to dictate whether or not they could use the ground form. Did they separate them officially again? Sort of — there’s a tome you can purchase that will give you ground travel form back again as a separate ability. It’s called Tome of the Wilds: Stag Form, and you can purchase it from either Moonglade or The Dreamgrove. I never really understood why they consolidated flight and ground travel into one button anyway — I mean, I can pick whether I’m using a ground or a flying mount in my mount tab. It only stands to reason that Druids should be able to do the same! Question: Are there zones with Silvermoon City quest hubs besides the two starter zones for Blood Elves? I remember a Blood Elf outpost in Hellfire Peninsula but that’s about it. There’s a few lone outposts scattered around Azeroth, but most of the Silvermoon City rep is contained right there in the starting zone. There is the option of picking up a Silvermoon City Tabard if you want to continue gaining rep as you level — pretty much any leveling dungeon you do along the way will give you Silvermoon rep, as long as it’s a dungeon that rewards reputation with somebody. I sort of wish those tabards applied to quests as well, but they don’t want to make that rep grind too easy, I suppose. Somebody remind me – have they stuck a mailbox in the DK starting area? There’s one, but it’s out in Havenshire, in front of one of the buildings. If you find it, you’ll also find a quest waiting for you there as well. Acherus doesn’t have a mailbox in the starting area, but it kind of makes sense. At that point Acherus is still under the Lich King’s control, so…who exactly is going to send mail to the Lich King? And who the heck would deliver it? I mean the Postmaster is a pretty powerful magic user and all, but I don’t really expect he’d be keen on the idea of a direct line to Lich King HQ, you know? Q4tQ: what happened to Loh after his journey? did he become Shen-zin Su? Oh gosh no — while that’s an entertaining thought, Loh was a Tortollan, and Shen-zin Su is a giant sea turtle. Two entirely different species! I like to think after Loh was done with all his wandering he just went back to one of those underwater Tortollan bars and told his stories to anyone that would listen. I mean, the Tortollans had to get the stories from somewhere to hand down, right?